Quite the pair of plots this week. Also the first time they've spoofed the same title twice in one season. Bart's plot was definitely the better one, and the boy was in top form this week. His antics at the asylum, pretending to be a sociopath, and his horror at his actions in what he thought wasn't a simulator. (Excellent save on the writers' part there.) Homer and Marge were wonderful here, too. Excellently done stuff. Lisa's plot didn't shine as brightly as her brothers (such is the fate of the middle child), but was still pretty good. The computational loom was actually kind of neat, her interaction with Milhouse was cute, and the closing bit at the museum was a good laugh. Mostly mixed views but definitely agree that Bart's plot was the better one. And it was actually quite neat how his plot was a direct result of Lisa's too. That said, wasn't very fond of Lisa's plot. Always found those overdone sexism scenes rather cringey especially when it's coming from someone like Martin who may be the girliest character in the show and that's including the girls. It just feels really forced when half the time the characters didn't really act like that but that was a minor little thing anyway. 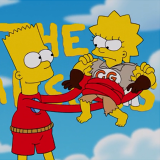 The great bit with Bart and the drones is probably another example of why I feel that, with a few exceptions, the writing of this season feels a bit... stronger than a bunch of the past ones. Like, not 'return to S1-8' quality (other than HoH of course) but it feels like they're onto something with where they are right now. Hopefully it continues to pick up. I agree that the writing is finally starting to shape up again. I actually really liked Lisa's part, and the thing is that what she hit on is true IRL - women back in Ye Olden Days were sent to asylums for being non-compliant. Just in this case it turned out the person she admired was less than perfect. 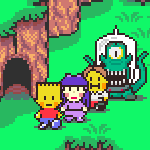 Bart's plot was very old-school, and I liked watching his gradual realization that the paradise he thought he was sneaking his way into was anything but.